What better way to end a long trip than with a party? 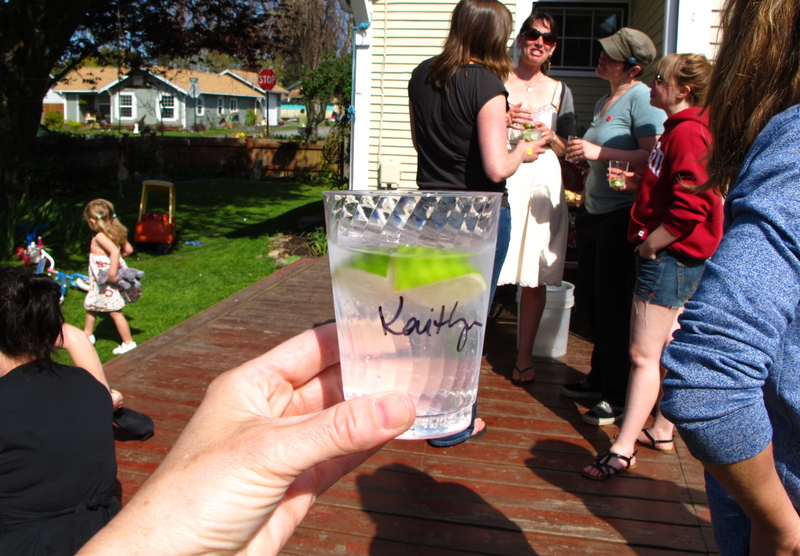 And what better party than the opening day of gin & tonic season? And a happy end of the road to me. See you tomorrow with something new. This entry was posted in Bellingham, WA, Road Trip 2011, WA and tagged Bellingham, first sunny day in a month, Gin and Tonic Season, looking forward to something new, refreshing beverages should get their own season, WA. Bookmark the permalink. ← It is good to have an end to journey toward. so so so so fun. so so so so glad you made it in time. :) now….let’s get on with all the celebrating to be had! So there really *was* a drink in Washington with your name on it — literally! What’s all that green stuff on the ground in the background. It looks soft. Thanks! The nice thing about G&T season is that once it’s open, it’s a free for all. And there’s always next year! How are you feeling? Congratulations on a well done road trip (also well documented). We are happy to see you arrive safely in the land of paradise and some well deserved r & r. Talk to you soon. I’d love to make plans to come see you all one weekend this month. We should make plans. Success! Kudos for making a plan, planning for the plan, documenting the plan, and seeing the plan to it’s conclusion. Very inspirational. Might be that one day I’ll try that.